The Wild Boar or wild pig are not native to North America but can be hunted for sport in the United-States such Florida along with several others American states. Outfitters located across much of Canada and throughout Europe, Asia including Australia also allow hunting. The distant cousin of our current domestic pig, boars can grow into sizes between 111-221 pounds and have adapted to our North-American climate very well. Usually they can be seen during the fall and winter months huddled in small groups, in a natural hole or recess covered with branches providing them with cover from the elements. Expert guides have told me that you can sometimes see the heat rising from the ground. Adult males will also grow tusks which can reach 6 centimeters in length and are used as a weapon or tool. Although attacks are rare, be very cautious when hunting wild pigs as the males will charge if they feel threatened or cornered. They can outrun man and can reach speeds up to 48 km per hour. The headlights of the truck lit up the dirt road as we made our way down the hill toward the boat launch site on the northern shore of the river. Just a few minutes had passed now and we were already parked and unloading our gear, decoy bags, shotguns and our backpacks. Prior to stepping out of the truck, I always check and make sure that my LED head lamp is placed over top my tuque and that I turn it on during morning duck hunts because we often work and get ready in the dark until we get to our hunting spots. We removed the straps holding down the canoe to the roof of the truck, then lifted and spun it around at the same time placing it on the ground. We carefully filled it up with our gear and carried the canoe down to the water’s edge. It was a cold morning with the temperature sitting at around minus five degrees Celsius but there was no wind and the water was dead calm not a ripple in sight. The sky was very clear and had a purple color to it with the sun sitting just below the horizon, you could also see all the prominent stars. I stood up by the canoe picked up my life jacket and turned it inside out, so that the black inside part was facing out and I then climbed into the bow of the canoe which was now facing directly south and being held by the other hunter. We pushed off quietly and started paddling across the wider part of the bay; our plan was to cross the larger part of the bay and head in a south-easterly direction. On the other side there was a steep embankment with a trail that we could use to get to the small inner islands and end up in distributaries. Once we reached the other side of the bank and worked our way through the trail pulling the canoe by its strap, we noticed that our primary waterway was frozen over with around an inch of ice. We now had to prepare our decoy placement, so the canoe was pushed onto the ice and as we climbed in our weight it caused the canoe to break through the thin layer of ice and then we started paddling and breaking our way through the ice moving toward the center of the waterway. Once in the middle using just our paddle blades, we broke the ice into a very large circle shape and then placed our decoys and electronic duck Mojo into the water on its twelve-foot pole. With the decoys setup in a scattered formation, we slowly made our way back to the shoreline and to our respective shooting spots. We were about fifteen meters apart, now in a kneeling position; I collected some deadfall and several broken branches and built a small blind in front of me along with some foliage. This would create a natural looking barrier between the duck decoys and my shooting position; if needed I could lower myself in behind the shelter so that if the ducks flew in for their initial fly over, they would not see me. One thing that I have observed is that if you call out several duck calls and attract ducks toward your decoys, mallards will fly in from several directions and quite often they are in groups of two or three and sometimes more depending on your location. I have seen twenty mallards all bunched up together in flight. So stay low and wait for them to come in within shooting range. You need to study their flight pattern and within a few seconds judge whether you will have a close shot or you may have to take a long shot. It may seem like at times that you are anticipating and trying to interpret what direction they may take, their wings formation and shape in flight can tell you a lot about their next move. We waited for the half an hour mark before sunrise and then whispered to each other that it was now time, we started calling hard with some combo calls letting out comeback calls and feeding calls. Within minutes two mallards flew in from the south-west and came in low between me and the decoys about fifteen meters out. I quickly lined up my bead site and released a shot of #4 my first mallard fell onto the ice surface and slid a few inches then stopped. We kept on calling and more ducks flew in but then gained altitude and landed further to the east near the shoreline where the ice was thinner and had open spots. The other hunter on my left decided to work his way up the bank to the east and attempt to harvest the ducks that landed minutes earlier on our left. I took a quick look around and above then called again, several comeback and feeding calls, soon more ducks came in very high from the south-west, so I released another shot, it was a miss, pumped the action and fired a second shot hitting the last duck in the group of four; the duck froze in mid-air and plunged several meters into the ice surface piercing a hole the size of the bird then got stuck below the surface. I called again with a very loud comeback call and then waiting around ten minutes and called again with some feeding calls. Two more ducks came in from the south-west then dropped down circling around into the water hole were the decoys were floating. I fired another shot and hit a mallard hen, the bird froze in the air, dropped and landed on the opposite shore line of the water way. It was my longest shot this season and a successful harvest. It was a fantastic hunt! The triumph of a hunt is not only measured in having successfully harvested a game bird or waterfowl as a trophy. We should also remember the time spent out in nature, actively practicing the sport we love; additionally there is also the possibility that you could bring home a bird and have a wonderful meal with friends or family. But before this can be done there are several steps that need to be completed. Ultimately, your decision on how to proceed with the processing of your harvest is the main factor of the final outcome. For example if you staying at a hunting camp and you know that you will be there for several days, then you might not even freeze the meat, once the bird has been field dressed. It could be cooked at the camp within the first few hours following the harvest. This way you can enjoy a nice meal during the hunting trip or decide to bring some home as well. Some hunters just remove the breast meat rather than use the whole bird, which could include the legs and some of the internal organs or even the tongue. This is done by removing all the feathers on the belly portion of the bird, then slicing through the breast skin, peeling it back and then with a sharp knife, placing the blade point at the top of the breast bone and cutting down each side. Moving from top to bottom. You could end up with two great strips of duck meat. If you wish to do both, field dress but also keep the feathers and parts of the bird, so that a taxidermist may mount it, then I recommend you conduct the necessary research and see what is needed in order to obtain a great trophy. If you are out hunting waterfowl and it involves some travelling then it is your obligation to keep at least one wing fully feathered and attached to the bird. This way if you are stopped by a game warden, the wing will enable them to properly identify the species. For more information or questions, you can consult the following Environment Canada web link concerning transportation of migratory birds. Field dressing is described as the process of removing the internal organs of a bird or mammal which has been harvested during a hunt. These steps better prepare the meat for cooking, but also facilitate the transportation of the game and decrease your chances of spoiling the meat or getting sick. I am continuously trying to find ways to improve my skills and one of the methods I use is finding great books to read. My most recent find is the “Grzimek’s Animal Encyclopedia Volume 7 Birds. 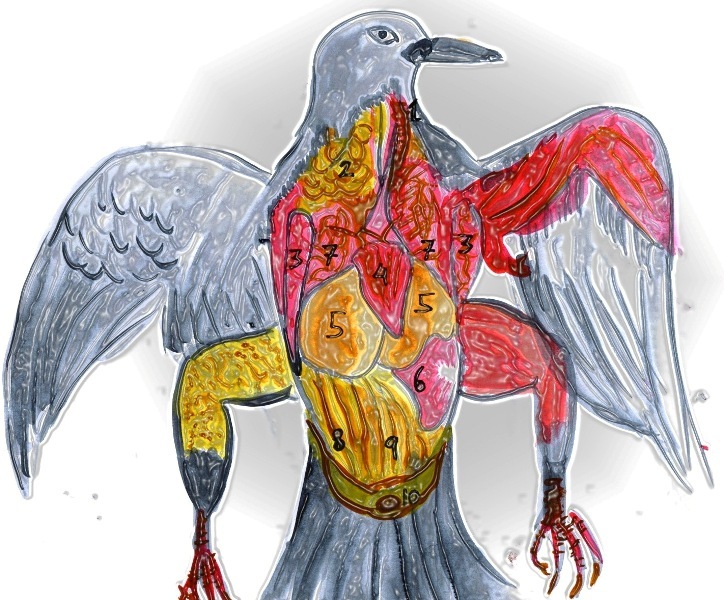 It is an incredible book full of knowledge about birds, and the part that interested me the most for this particular blog post is bird anatomy. It is not necessary to be a surgeon in order to field dress game but it is important to be able to identify the main organs, so that you may conduct a proper field dressing process in a safe manner and prepare the game correctly for transporting and ultimately cooking. My field dressing kit consists of a very sharp knife with a short but extremely sharp blade, and it does not exceed three inches and has a hooked blade tip for cutting the windpipe and this also allows me to be able to detach certain organs from internal tissue. I have several cheese cloth bags to keep the insects and dirt off the game but plastic bags from the grocery store will work just fine too. I have a box of latex gloves, this way I avoid direct contact with the blood or skin. A cooler filled with two ice packs to keep the meat cool during my transportation. A box of large size Ziploc bags can be quite handy. During the field dressing of a game bird or waterfowl the first thing I do, is inspect the bird for any abnormalities, checking if the bird is sick or very small. This could help in identifying for spots or even removing flees, and seeing if there are there patches of feathers missing. Then I proceed with removing the feathers from the bird except for one wing. I always complete this process outside avoiding unnecessary mess in the kitchen. The tailgate of the truck or even a cutting board at the hunting camp makes for great work surfaces, having water in a bottle or tap close by is also really great to help clean the bird as well as your hands. I hope you have great season and wonderful meals too.